Fly the margins if you want, but it's only the One who is at the center that will enduringly satisfy. Wayne continues his conversation with Dr. Robert Stamps who holds a PhD in Eucharistic Theology from the University of Nottingham and has been an United Methodist ministry for most of his life. 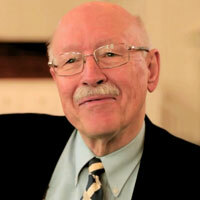 More recently he has served as Dean of the Chapel and as a professor of systematic theology at Asbury Seminary. They continue to discuss Communion, the Incarnation, how we walk through painful circumstances, and how we can hold to the Center to keep our journeys on track. When their conversation ends Wayne processes his thoughts about teaching done well in the body and how our continued dialog about God not only enhance our own journeys but also help us explore the wonder of the body of Christ. So the best thing to do is admit that we have a theology, and then seek to understand and refine it by interacting with others through conversations, books, sermons, discussions, blogs, and podcasts. And as you say, it is not wise to “gather teachers around us who tell us what our itching ears want to hear,” which is why I read books, discuss Scripture, and listen to podcasts from people who have different perspectives and viewpoints than I. In this way, I find that books, blogs, and podcasts can be a mentor to me when there is nobody around with whom I can sit and talk for 15 days. (Or even 15 minutes). I consider C. S. Lewis a mentor of mine, even though he died before I was even born. This sort of perspective is hopefully encouraging to those who feel alone or on their own when they seek to follow Jesus outside of a Sunday morning gathering. Wayne’s comment about surrounding ourselves with teachers who would tickle our ears had me thinking “am I doing this with God Journey”. I’m happy to say this morning God affirmed we’re good through listening to the first couple of chapters of 1st Corinthians on the way to work. Which goes back to your podcast with Bob and the bible’s place in our relationship with God. So excited this morning to recognize God talking to me and answering my questions. Thank you once again Wayne for a a thought provoking podcast. The whole theme of “moving to the center” is a conundrum to me. I know some people who are sure the “moving to the center” would be a sure sign of end-times i.e. “one wordlism”. Where to others “moving to the center” only implies accepting/respecting that God can work in many ways to accomplish His will. So where does that leave us? Are my wicked ears only “twitching”? How do I determine when/where someone has crossed the line in their personal “theology”? or are merely opening my eyes and ears to another facet of God/Jesus/Holy Spirit? I have a healthy distrust of “elders”. I know that no one person has a 100% absolute correct understanding of God’s ways. Is the “yuk meter” the HS’s method of my discernment of correct theology? What is “centrism”? Acceptance of even those things that do not ring true for me? I’m sure I could find a passage or an elder who would confirm my understanding. How do I know for sure? Bev, by center, I didn’t mean centrism or one wordism, I simply met we keep our hearts centered in the reality of who Jesus is. His Spirit helps us do that. We don’t need another man to tell us where the center is, it comes from a growing dependence on the Holy Spirit as he guides us into all truth. Older brothers and sisters can be helpful in encouraging us to listen, but they don’t take his place in our hearts. When I use the term elder, I’m not using it as a position in a traditional congregation. And I’m not using it chronologically. True elders are a gift. If you’ve never known an older brother or sister on this journey who know Jesus well and also how to encourage you without lording over you, you’re in for a treat. Elders are a gift. At every stage of my journey God has had one of these near me to help encourage and illumine what God was speaking to me. No true elder asks for your obedience. No true elder will tell you what to do. No true elder will obligate you to themselves. You’ll know you’ve found a true elder when they are a gift to you. If they are not a gift, but impose themselves on your journey, then they are not one for sure! Here is the reason that it is important to listen to the archives. I am now just 9 months plus behind trying to get back to caught up. Having heard them all before this, some 3 times and I had to stop and write this. The discussion about Christ coming to our table, my table, living my life step by step with me. I’m ready to hear this now, but just 2 months ago these would have just been words, a goal for me to shoot for. But now, he is truly my brother, I know my Father, and walk with the Spirit. We (the people) are all on the same journey yes, but to hear look at the waterfall, while I’m only able to see the meadow cannot be translated by me or my brain. I spoke the language of family while I was sitting in the building, but as I walk free, I now KNOW the truth of family. IT IS REAL.